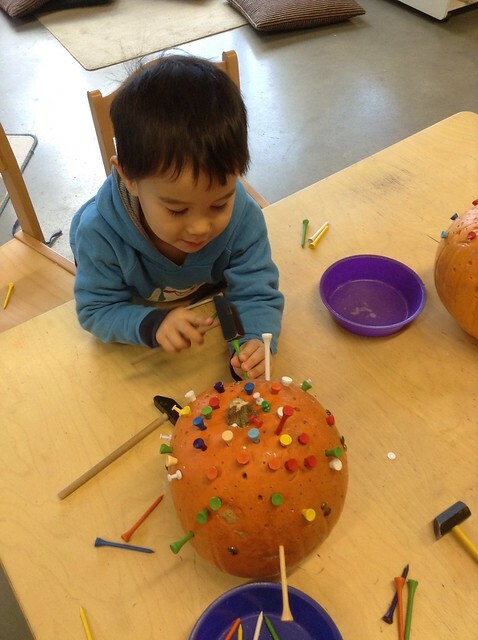 Yesterday we had a Halloween day in Preschool! We talked about why we celebrate Halloween, why we dress up and why we carve pumpkins (the children found it very funny that people used to carve swedes). We talked about how many pumpkins get wasted every year and thought about how we could use all of the pumpkin so we didn’t throw it away and waste it. The adults cut open the pumpkins and let the children scoop out all of the seeds and flesh. We decided to roast the seeds in olive oil and then ate them at snack time (they were delicious!) We also roasted the flesh and when it had cooled down we mixed it with oats, honey, water and vanilla extract and made our very own pumpkin pie, which the children enjoyed eating at the end of the day!